We needed cheap wireless service for my husband’s old Sprint HTC EVO 4G phone, and after I found a list of Sprint MVNOs I narrowed my choices to Ting and Chit Chat Mobile. Both Ting and ChitChat offered great wireless fees, but I think what sold me on Ting was the vast amount of quality help on their web site. Questions on their discussion forum were answered promptly, there was an extensive knowledge base, and I loved how clean and simple the Ting web site was. I was confident that if I ran into trouble with our older HTC EVO phone, there would be someone to help me. I especially liked their billing & rates philosophy. They only charge for the amount of services used, in levels or “buckets” of XS through XXL. Their rates are very reasonable and I love that limits can be set so you’ll never spend more than you can afford. 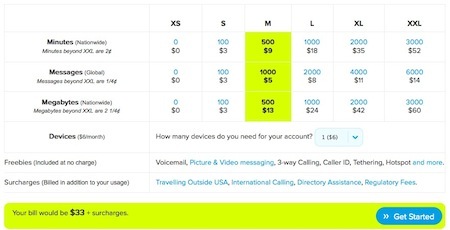 The only extra charges are fees for each device and other surcharges like taxes. Their most popular level is M, but you can mix and match for whichever or whatever you use the most. For instance, I’m planning on no more than 500 voice minutes, 1000 text messages and 100mb data. Including the $6 fee for our one device, our monthly charge hopefully will be no more than $23 plus taxes. And if we only use 100 minutes or 100 messages, our rate will drop to the lowest level. You only pay for what you use! It’s really simple to view your usage at any time by logging into your account, and viewing the dashboard. They also have an Android app as well. You really can’t get any more straight-forward than that! To make sure we don’t go over, I was easily able to set a cap for data and other “alerts” that will warn us when we are getting close to our monthly limits. They have a great video tutorial that explains how alerts work. 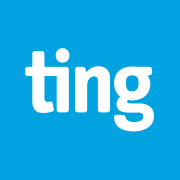 What I found to be most impressive about Ting was their customer service. I phoned them twice and both times someone answered immediately. No pressing #1 for this department or #2 for that department. Someone competent answered the phone and my questions were answered intelligently without frustration. How refreshing! Activating the HTC Evo was fairly easy, and it can be done on their web site, using their activation form. You will need your device’s MEID number, which can be found in the phone’s settings menu. If you are porting your own cell number, you’ll need your current cell account number and PIN/password. We had a little trouble with activation because his EVO phone still had remnants of a very old cell number, so we had to perform a carrier wipe and device updates by following the steps on their knowledge-base tutorial. Then we got data and MMS working easily by following the next steps in the same tutorial. So far, our wireless service has been fine, the same as when we had Sprint service before. The only negative aspect is that Ting only offers Sprint service for Android phones! Darn! I want to find a wireless company like them that works with iPhone! Once we experience a couple of billing cycles, I’ll be sure to post an update. So, if you enjoyed my review and would like to try Ting for your Sprint wireless service, then click the link below to receive a $25 credit toward a new device or wireless service. I used someone else’s link when I signed up, and immediately received my $25 account credit. It really works! One last little tidbit about Ting is that they are a division of Tucows. I remember Tucows from years back selling domain names and offering free/shareware software downloads. We recently set up an older Verizon Blackberry Tour 9630 phone for cell service at PagePlus, a Verizon MVNO (reseller). So far it’s working out very well. My husband needed a talk/text plan (no data) and the Blackberry keyboards are so easy for texting, much better than a cheap flip phone. Originally, we unlocked the Blackberry Tour using cellunlock.net for $7.99 (watch youtube video for discount) – and then used a T-Mobile sim card with the monthly 1500 talk/text plan for $30. It was a great plan, but because the Blackberry Tour could only access Edge 2G, the phone was virtually useless in and around our home. So, we decided to give Page Plus a try. They are a Verizon Wireless MVNO, (mobile virtual network operator) which basically means they are a Verizon service reseller, buying the service in bulk, then setting their own fees. Their Talk n Text plan was perfect for my husband. It offers 1,200 Minutes and 3,000 Texts. The plan also includes 100mb of data, but unfortunately, I’m not sure how to set up the Blackberry Tour for data use. The first thing we needed to do, was port my husband’s T-Mobile cell number to Page Plus. I tried the process online initially, but we ended up having to call their customer service. We had the Blackberry MEID number handy, which can be found in the Blackberry “Options>Status” menu. We also had other necessary info like the T-Mobile account number, pin number, etc. Once we knew the phone wasn’t hooked up to T-Mobile anymore, we called the Page Plus customer service again and they activated our Blackberry. I can’t recall the exact steps, but we had to type in several codes/numbers in one of the settings. Then I remembered that we had to change the network settings when we initially unlocked the phone, so we clicked Options>Mobile Network and changed the “Network Technology” from GSM to 1XEV. So far, we’ve been using the PagePlus network for a few weeks and it’s worked very well. I do have to mention that their online account access is very basic, with only the bare minimum of information available. It displays your current plan, expiration date, and the amount of minutes/texts left. There is a link for Call Records, and it’s updated very quickly, but the “range” options are a bit confusing and don’t always match what you’ve selected. But it’s a great price and so much less expensive than Verizon (especially for a Blackberry) so I’m really not complaining. Just wanted to warn others what to expect. If you have an out-of-contract Verizon phone hanging around, and don’t want to keep paying Verizon exorbitant fees, we recommend trying Page Plus Cellular. UPDATE (2013-06-14): We used Page Plus last year for about a month, it worked very well on the Blackberry Tour. The only reason we stopped the service was because my husband acquired a new phone at work. I phoned customer service (warning: I was on hold for many minutes waiting to talk to someone), recited the MEID number (Options>Status), dialed *228, restarted, and the phone was up and running with a new cell number and $2 credit. A few weeks ago, I never realized that there were other options for my older (out of contract) iPhone 3GS, but when the news broke that AT&T was now “unlocking” iPhones, I learned that there was money to be saved on my monthly bill! So, after I completed the unlocking process for my iPhone 3GS, and a couple of weeks of online research, I decided to switch my monthly service from AT&T to PureTalkUSA. Why did I choose Pure Talk? Well, reason #1 was price. For $44, I would have unlimited talk and text and 300mb of data each month. AT&T only offered me 200mb; I had no trouble sticking to that allowance, so I knew 300mb would be plenty. PLUS, I’d be saving almost $20/month on my bill! Another important reason was that PureTalk is an AT&T MVNO (mobile virtual network operator) which basically means they are an AT&T service reseller, buying the service in bulk and setting their own fees. I knew my network access/speed wouldn’t be compromised because it would still be AT&T. I had considered trying T-Mobile’s prepaid service, but unfortunately at this time, TMo’s network runs on a different frequency, which would drop my service down to Edge/2G. Our home is in an area that doesn’t have good Edge service, so it would be really difficult to use my cellphone inside/around the house. I did hear that TMo is in the process of upgrading, so eventually, they will be on par with AT&T as far as 3G access on the iPhone. I will definitely consider them in the future, but for now, Edge is just too spotty and slow for me. I ordered my free PureTalk simcard online, and it shipped quickly, and I received it in a matter of only a couple of days. The sim card arrived with an instructional letter, which included important info for activation, like account and sim numbers. I couldn’t complete activation online, because I was porting over my old cell number; I called PureTalk’s customer service, and the process was quick and easy. The rep informed me that I’d receive an email when AT&T released the cell number; worse case scenario was 48 hours, but it rarely ever took that long. I was thrilled to receive the email in only about 90 minutes! Yay. So I removed the AT&T sim card and popped in the Pure Talk sim, and rebooted. It was so cool to see the “Pure GSM” text on my iPhone screen. Setting up text/talk was very easy, but mobile data access was a different story. 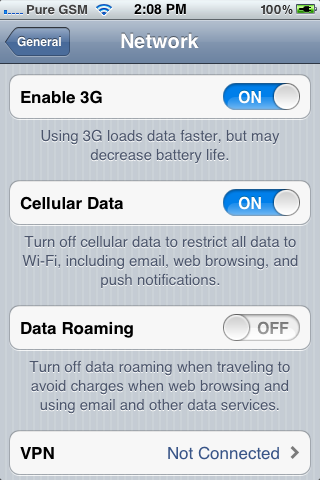 In order to set up the iPhone for data, the APN settings need to be changed to PureTalk’s specific configuration. I was at a dead stop because on my iPhone, the Cellular Data Network menu was unavailable! Thankfully, there was a safe, legal fix (doesn’t require a jailbreak). Using a wifi connection on iPhone, browse to http://www.unlockit.co.nz – choose your cell provider, and save the new APN file to your iPhone. Keep that file there until you switch to another provider. So, it’s only been a week or so, but I’m happy with PureTalk’s service so far. My cell/data access has been the same as with AT&T. I’m on the fence about their customer service at this point. I have contacted them by email with two separate concerns, and received only one response in a timely manner. I did not receive a response to my second inquiry, even though a help ticket was opened. Thankfully my question wasn’t incredibly important, but still, it would have been nice to receive an answer. I will probably continue to use PureTalk, as I don’t think any other MVNO would be any better. UPDATE 2013-07-28: I’ve been using PureTalk for over a year now, and it’s been great. They text me every month when they charge my credit card and I’ve had no problems. Wireless service is probably not as strong as if I were a direct AT&T customer, but it’s fine on my old (slow) iPhone 3GS. I like saving $money! I was posting an ad on Craig’s List today, and noticed how crappy the photos looked after uploading them to Craig’s List. Yuck! There had to be a better way. I tried compressing them further, and no luck, Craig’s List still compressed them further and they looked horrible! After googling, I found a forum post that helped! I never realized that you could upload your photo files elsewhere online, and then link to them using the html tag! Awesome! So, I resized and optimized my photos again (larger) and uploaded them to my Google’s Picasa Web Album. From there, it’s easy to set up a link. Note: this tutorial is specifically written for google’s Picasa online photo management, but you can use many other online photo management web sites like flickr or photobucket. But if you have a gmail account (and I strongly recommend that you do, especially if you’re regularly posting on Craig’s List), then you automatically have your own Picasa photo account. 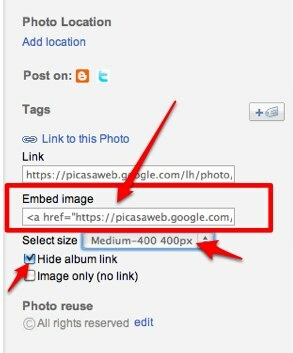 In Gmail, click the “photos” link to go to Picasa Web Albums. If you need help resizing and exporting your photos for the web using iPhoto, please read over my tutorial. If you are using Picasa, I have a tutorial for that as well. Both tutorials are older from previous years. 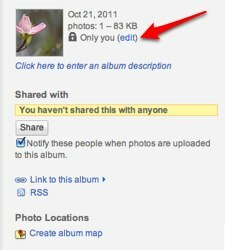 Once you are in Picasa Web Albums, click the “upload” link. If you have the Mac Finder open, you can easily drag your files into the open space on Picasa, or if you prefer doing things the old fashioned way, click the “Select photos from your computer” link and choose them that way. Once all your photos are uploaded, click the “ok” button on the bottom right. Once uploaded, your photos will be organized in the new album. Click on the first photo. Once the code is highlighted, click Edit>copy from your browser menu. Launch your Craig’s List ad text in a new tab or window in your browser and when you are ready to insert the photo into the ad text, choose Edit>Paste and the code will be pasted into your ad. Now preview your Craig’s List ad to make sure the photo is displaying properly. If so, then repeat these steps for your additional photos; paste the codes after each other in your ad. IMPORTANT SECURITY NOTE: I’m super paranoid about Craig’s List, and you should be too (there’s a lot of scammers and nefarious browsers out there) so be aware that these ad photos are linked back to your Picasa Web Album (and gmail email address) – My advice is to set up a completely new gmail account that remains separate from your home/personal email account. That way you are not inviting strangers to view personal/family photos that you might have previously uploaded. Keep your Craig’s List photos completely separate from your personal photos! Even if you set your other photos as “private”, you could be inviting a hacker! Good luck and I hope this tutorial helped! I didn’t hear about his death until 11pm last night. I was watching TV in our bed and a local news update came on mentioning Jobs. I thought I misunderstood but then a 2nd update later mentioned the death again. How sad. I got out if bed and logged on to twitter to see what happened. Yes, it was true. He was really gone. What to say about it? It’s difficult. I knew it would happen eventually; the news of him resigning as CEO of Apple only a month and half ago was sad, but I didn’t think the end would come so quickly. He’s gone, but never will be forgotten. He’s shaped the technology world with his vision and imagination. I will miss you Steve Jobs! I’ve always understood and accepted that Facebook saves all your content, even the stuff you delete. What I didn’t realize was that it’s still 100% accessible to anyone that has the right link, and worse, Facebook is actively promoting and encouraging access to your deleted content! Today was a real eye-opener. My Facebook friend and I were posting on a conversation on her wall about biking and walking to work. I happened to notice one of the “Memorable Status Updates” on the sidebar of her wall. There was an interesting conversation about exercise from about 18 months ago, so I clicked, and posted a new comment on the old thread. My friend questioned me as to how I found the old discussion, since she regularly cleans her wall of older posts, deleting them. She informed me she deleted it months ago! Now, as I previously mentioned, the fact that Facebook retained deleted content didn’t really surprise me. What DID surprise, stun and scare me was that Facebook was actually promoting and encouraging access to said deleted content! So, that means that if you posted something terrible about your boss or inlaw, change your mind, and delete it a few days later, if you become Facebook friends with that person, they might actually find that post on the side bar listing “Memorable Status Updates”. EDIT 2011-04-10: It’s funny, since I wrote this, I haven’t seen any instances of the problem. Thankfully, maybe Facebook came to their senses! But this proves that they CAN pretty much do whatever they want with your content, and the cat could be out of the bag before you realize there’s a problem! Don’t put anything on Facebook that you don’t want to be public – JUST IN CASE they decide to mess up again! I was hesitant to leave my “unlimited” data plan, but looking back at my usage, I barely hit 150mb most months. There were occasional months that were over 200mb, and one month when I was a heavy Pandora Radio user, I hit 300+mb. Most usage is on my own wireless network at home. And since my contract is up at the end of June, I don’t foresee staying with AT&T very much longer after that. So, for now, I am saving $15 per month, and that’s good! I should have done it months ago! UPDATE January 20, 2011: wouldn’t you know it. I was watching maybe 10 minutes of streaming video on my QVC app, and shut it off. I guess I didn’t shut it off properly, or there is a major bandwidth leak in the app, but a couple of hours later, I receive a text message (and email) from AT&T telling me that I’ve used 65% of my allotted data. Oh no! I check the QVC app, and it was still “running” in the background, so I quit…and then about an hour later, I receive two texts in a row telling me I’m at 75% then 100% of my data plan maximum. Crap! So I call up AT&T, and long story short, I upgraded to the 2GB plan. sigh. I’ll sign in again at the beginning of the month to revert back down to the 200mb plan. I was over the plan by 200mb, and duh, why did it take AT&T so long to inform me? Both text and email messages came too late! They were useless! It’s a good thing that Verizon FIOS , by default, offers its customers at least a little security on their wireless routers, instead of leaving them with a 100% open wireless network. I suppose it’s in Verizon’s best interest, since an open wifi network would allow neighbors and passersby to jump on to their internet service for free. But truthfully, the default security WEP is extremely weak, and is very easy to hack. Just google "WEP hack" and you’ll find pages of article and tutorials! So what does that really mean to you? It means that anyone in range of your home can easily gain access to your network. Why is that a problem? Well, if they are sharing your network, then they can easily achieve access to your computers, stealing private info, snooping on your activity, gaining access to your email accounts, installing malware, etc. The good news is, you can easily change the router security from WEP to WPA2 with just a few clicks. And you can even keep the same numerical password / key if you’d like, but I highly suggest to change it, but that would be up to you. So, there is no excuse anymore! Lock down your router! It only takes a couple of minutes! DISCLAIMER: I am NOT a paid security expert, so please be warned that things can go wrong. The worst that can probably happen is you somehow lock yourself out of your wireless network. In that case, you can click the "reset" button on the router and all settings will revert back to factory defaults. Keep in mind, you should NOT attempt to make any adjustments when you are in a rush, just in case something goes wrong. In other words, don’t start messing with your settings right before an important online meeting that requires online access! See instructions on how to reset your Verizon FIOS router if you need it. This tutorial is based on the Actiontec MI424-WR Verizon FIOS wireless router. If your router is a different model or brand, then your settings might differ. If your computer normally accesses the Internet via a wireless connection, then I suggest using a wired Ethernet cable to attach your computer to the FIOS router. (Ethernet looks like a big telephone cable.) Since you are editing the wireless settings, it will probably bounce you out of the wireless network once any password changes are made. If you are bounced out of wifi, then you will need to log into the network again using the new passkey. At first glance, these instructions might look very confusing and overwhelming, but don’t let it stop you from trying. Print out the instructions and carefully follow each step. Take your time, and don’t rush. BREATHE and relax! First off, locate the Verizon FIOS wireless modem/router and turn it over to reveal the label with your model information. The tech that installed your service should have informed you that this is where your WEP password/key is located just in case you need to find it again. That "WEP key" is is what you’ve been using to log into your wireless network. While you are at the bottom of your router, make note of the serial number located under the bar code. You might possibly need it if your installation tech changed your admin password from the default password to something more secure. More on that in the next part. My hosting account moved me to a new server today. Fingers crossed that it’s all smooth. I know I have had problems in the past with server moves, something always goes hinky on me. And I can’t find any of my older notes/emails on the problems I was having in prior moves. sigh. It was nice to move anyway, the old server was getting busy, so I was noticing there was a lot of down time lately. I love my host (hosting matters) – they rock! They’ve just celebrated their 10th year anniversary in May, and I have been with them since Sept of 2000! Their customer service is right on! If anyone notices anything hinky on my site, please let me know! Thanks!